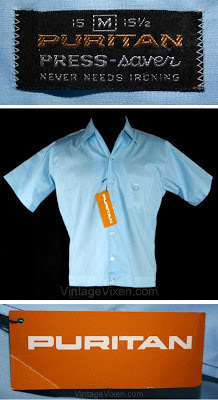 In the 1960s, gents wore sport shirts on the weekends that were polo style or button down, often with cool retro crests embroidered on the pocket. Puritan men's shirts were among the most popular, worn by many a pipe-smoking dad reminiscent of Fred MacMurray of 'My Three Sons' and similar sitcoms. 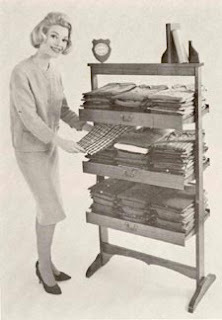 Puritan shirts, like those pictured in these 1964 displays, had unique details seen only in 1960s vintage sport shirts. Wing lapels, button & loop closures, notched sleeves and buttoned-tab accents at the waist are common details that distinguish these vintage styles from their modern counterparts. 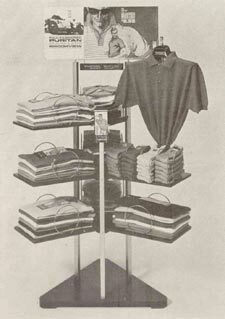 In the above display, Puritan sold polo shirts alongside dyed-to-match socks. 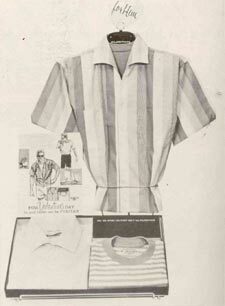 One interesting pairing Puritan designed in the mid-1960s was the In And Outer Set seen above, essentially a men's twin set with a ring-neck tee matched to a short-sleeved shirt jacket. These were marketed to women to buy 'For Him' as a thoughtful and practical gift. To step back in time and virtually visit these vintage displays, check our current selection of 1960s men's shirts.﻿ We've just updated with lots of choices for summer! I feel ecstatic I found you website and blogs. hi was just seeing if you minded a comment. i like your website and the thme you picked is super. I will be back.